Bear does not like birthdays. He doesn’t like parties or balloons, cards or candles. In fact, Bear does not like anything to do with birthdays at all. He would much rather spend his birthday alone cleaning his house, but Mouse, small and gray and bright-eyed, has other ideas. 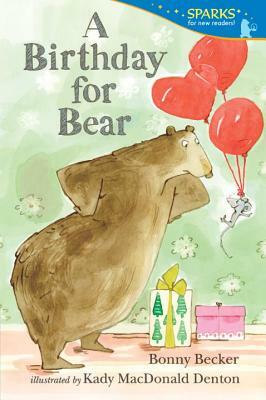 With a perfectly paced story by Bonny Becker paired with Kady MacDonald Denton’s slapstick visual comedy, A Birthday for Bear — previously published as a first reader — welcomes young listeners to the party in a new picture-book format, with all new artwork, ideal for sharing. Bonny Becker is the author of all the Bear and Mouse books as well as a number of other award-winning picture books and middle-grade novels. She lives in Seattle. Kady MacDonald Denton is the illustrator of the Bear and Mouse stories as well as Tim Wadham’s The Queen of France and Claire Masurel’s Two Homes. She lives in Ontario, Canada. With a nicely cadenced text in four short chapters, wonderfully fresh ink-and-watercolor illustrations, and a funny climax, this story works equally well for young independent readers or as a read-aloud for younger children. Mouse draws upon the sheer force of his cheery goodwill to chip away at Bear’s resolve, ultimately succeeding…Reads as a well-pitched combination of humorous dialogue and omniscient commentary. Whimsical full-color ink and watercolor illustrations hilariously depict the yin and yang of enormous, cantankerous Bear and tiny, merry Mouse. A sprinkling of colorful, out-of-the-ordinary vocabulary words and phrases adds welcome spice to the narrative. Fluent early readers will be pulled into this title by the appeal of its universal subject, entertaining characters, and the satisfying story.